"There were many activist groups. But the only one that really meant anything was led by Roj Blake"
Roj Blake lives in a huge domed, city on Earth. Like much of the rest of the population, his food and drink is dosed with suppressants to keep him in a drug-induced stupor. 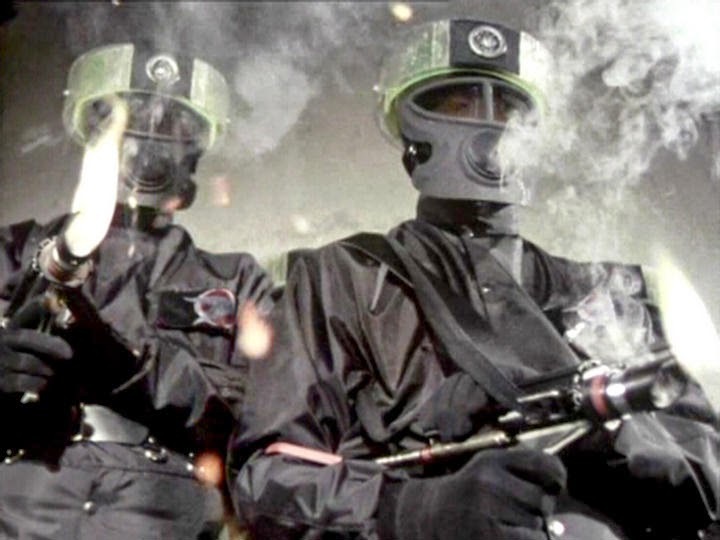 He meets up with two friends who persuade him to stop eating the tainted food before taking him outside the City for an illegal meeting of opposition to controlling Federation administration of Earth. At the meeting, Blake meets Bran Foster, a man he doesn't recognise but who claims to know him. 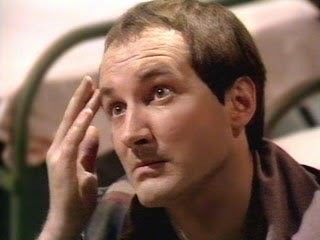 Foster explains to him that the two of them had once led a a large opposition group against the Federation before Blake was captured and had his mind wiped. He asks Blake to rejoin them. While Blake ponders this, the meeting is invaded by a squad of Federation soldiers who kill everyone except Blake. He is taken in for questioning but, although he claims to know nothing, the head of the Federation Justice Department, Van Glynd, decides that it would e best if Blake 'disappeared'. He arranges for false charges of child molestation to be made against Blake. Despite his defence attorney's best efforts, Blake is sentenced to spend the rest of his life on a penal colony. In the holding cells, Blake meets smuggler Jenna Stanis and thief Vila Restal for the first time. 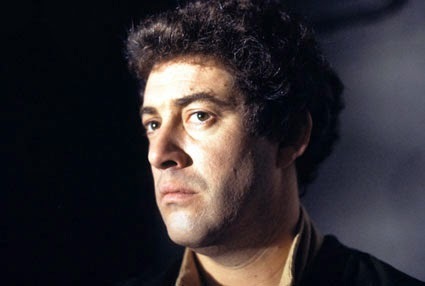 The prisoners board the prison ship and, as it lifts off, Blake vows that he'll get back to Earth. Blake (Gareth Thomas): Blake is sceptical of his friends' s claims that all his food and drink has been drugged in order to keep him docile. He's also reluctant to go outside the City walls as to do so is a 'Category Four crime'. Nevertheless, he does agree to do so as he's told that he'll meet someone who can tell he something about his family. Blake reveals that he has a brother and a sister who settled on one of the outer planets. This appears to be his only family. Bran Foster, the man he goes outside the City to meet, tells Blake that both his brother and sister and dead and that correspondence Blake received from them was faked. Foster goes on to reveal that, after his capture, Blake was mentally conditioned to turn on his fellow rebels. Then once the rebel threat was crushed, Blake was conditioned again to forget any involvement he may have had with the rebels. Foster now wants Blake to rejoin the rebels, who are once again ready to strike. 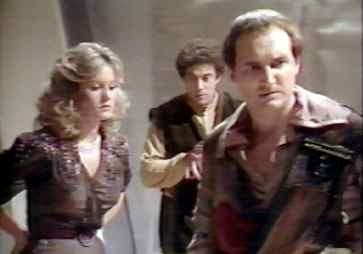 Foster's words do seem to have an effect as, throughout the episode, Blake begins to regain the hidden memories about his past life. His witnessing of the brutal massacre of Foster and the other rebels at the hands of Federation guards probably also helps to trigger some of those memories. He's still seen as a threat by the Federation administration who cannot simply execute him as he would be seen as a martyr by the rebels. This is why they end up concocting a false charge of child molestation and use it to get Blake sentenced to deportation to the prison planet of Cygnus Alpha. Jenna (Sally Knyvette): She first meets Blake as they are waiting in the holding cells to board the prison ship to Cygnus Alpha. She calls herself a 'free trader', although Vila prefers to call her a smuggler. He also considers. Jenna something of a celebrity. She appears to be the only woman prisoner (this is confirmed in the next episode) and, shortly before boarding the prison ship to Cygnus Alpha, she confesses to Blake that she's afraid of what's going to happen. Vila (Michael Keating): Like Jenna, he meets Blake in the holding cells for the prison ship. He's a thief, "compulsive I'm afraid", and the first thing we see him.do is steal Blake's watch. He has apparently had his head adjusted by some of the best experts in an attempt to remove his compulsion. All attempts have failed hence he is being sent to Cygnus Alpha. Vila is something of a coward. When Vila thinks Blake is going to attack him for stealing his watch, he maintains that he was just looking after it for him as "the place is full of thieves." Blake's Seven has a bit of a reputation for being somewhat campy and over the top. Whilst that night be true of certain episodes, it's certainly not an accusation that can be levelled at this episode or indeed much of the first season. Indeed, 'The Way Back' is probably about as bleak as the series gets. There are scenes of people in a drug induced stupor, scenes of mental torture and a surprisingly brutal massacre - and that's just in the first ten minutes or so. And it doesn't get much lighter than that in the rest of the episode. Blake is our way into this strange new futuristic world. The notion of him having had his brain altered so that he has no idea of who he really is the perfect excuse for Terry Nation to give us the background to the series and to the character of Blake without it seeming too much like an info dump. The Federation are quickly shown to be thoroughly evil and corrupt, first with the aforementioned massacre and then with the way in which their Justice Department attempts to remove Blake by framing him for child molestation. Their methods make it easy to sympathise with Blake and the other rebels. And the Federation are powerful. Blake is helpless against its might, being unable to offer up any defence to the false accusations made against him and the only people who believe him are ruthlessly killed. So, not for the first time in this series, the bad guys win. Blake's helplessness in this episode shows why he can't fight the Federation alone. From an acting point of view, Gareth Thomas carries the episode as Blake. It's not hard to see why Blake was seen as something of a figurehead amongst the rebels but he's not some one-dimensional square-jawed hero. He's also confused and vulnerable and Thomas does a good job of portraying that side of the character. Only two of the other regulars appear here and they're both sidelined by Blake's story. My favourite is Michael Keating's Vila. He gets some of the best lines and it's interesting that here Vila comes across as somewhat shifty and untrustworthy, a side of him that will be less noticeable as the series progresses. Overall this is a very good opening episode. It sets up the series well, while at the same time being fairly atypical of the series as a whole.